One of the very first rhythm games in video game history, PaRappa the Rapper was designed by musician Masaya Matsuura and with character design by Rodney Alan Greenblat. 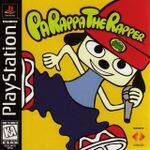 The player takes the role of the shy dog Parappa, who has to rap himself through lessons in order to win the girl of his dreams. The game plays a song, and the player must push the correct buttons in the correct rhythm. All songs are written in English, even in the Japanese release. The game was acclaimed for its simplistic design, using '2D' characters depicted like flat paper in a 3D environment. The characters were also made into an animated TV series in 2001. Source: Wikipedia, "パラッパラッパー," available under the CC-BY-SA License.